Managing your menus is not something that you are likely to do very often. However the Schudio system gives you full control over your menus. It's important to remember that pages and menu's are separate, and that's by design, it gives you more flexibility. Your page will not appear on the website until it is added to a menu. Menus can be found under the Menus option on the left hand side. 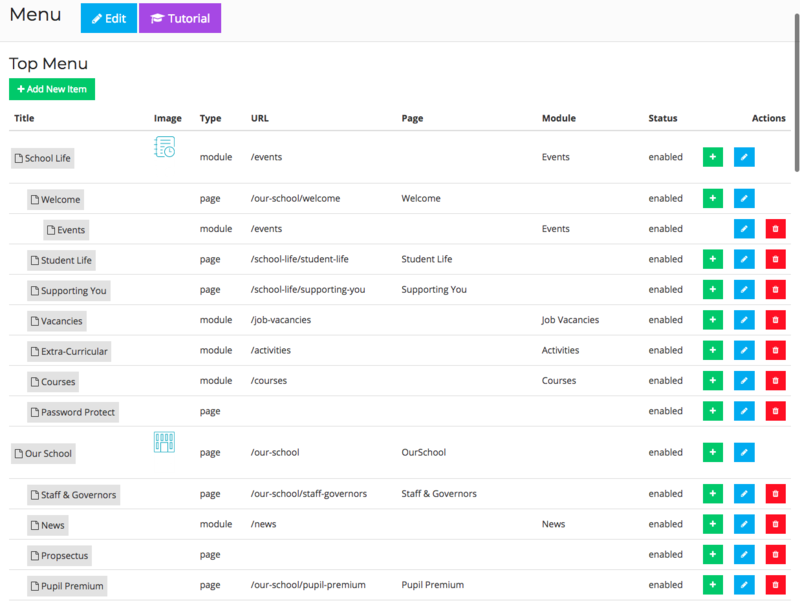 The menus page contains a list of the different menus currently running on the website. These menus will be specific to your site depending on your design. To manage a menu you can either click the name of the menu or the orange button. The top level menu items are those closest to the left hand side, each indentation indicates a sub level. In the example to the right you can see just 2 top level menu item. These top level items have lots of menu items indented below it. 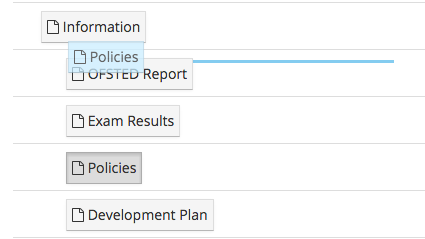 School Life has 7 sub menu items we can see, those menu items also have items indented below them. The menu system currently supports up to three levels. move and hover just above the item you want to be above. When the thin blue line appears stop dragging and drop the menu item there. After a quick pause the menu will re-arrange and the items will be re-arranged. To move a menu item into a submenu drag the menu item you want to move onto the item you want to your menu to be indented below, when a thick blue box around the menu item appears drop the selected menu item, and a sub-menu will be created. If the submenu already exists you can drag your menu item until the thin blue line appears and move the menu item this way. When you move a menu item all of the menu items indented below it will move with it, and retain the same structure. 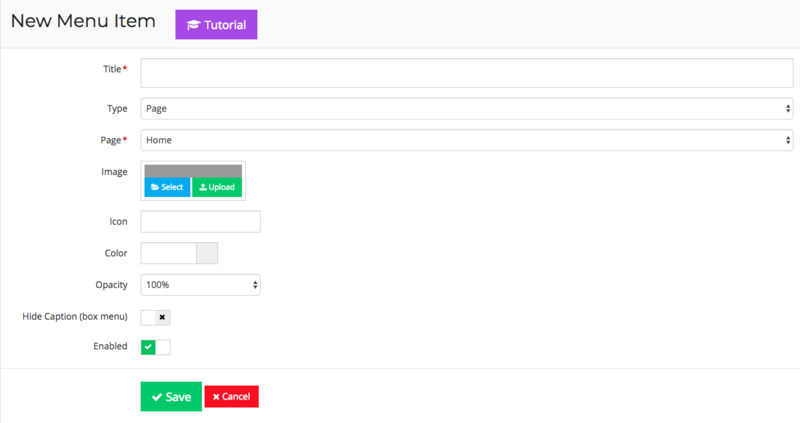 There's no save button on this page, any positional changes made to menus are saved and applied straight away. Make sure editing is being done on the specific menu and not the list of menus. A new menu item can be added in different ways from the menu page. 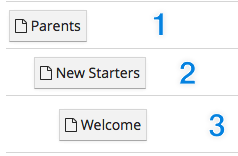 Click the green "+ Add New’ button at the top of the page to add a new top level menu item. Click the small green + at the end of a row to add a menu item as a sub-menu of that item. To edit a menu, click the blue pencil in the row of the menu you want to edit. Click the red cross in the row to delete the menu item. Below is an explanation of the fields on the Menu item page. The title for the menu, and appears on your site for users to click. It should explain what content will be found within the menu. This is a dropdown field for the type of link this menu will be. This field changes the field below Type, which is where the specific link is selected. This field is appropriate for box menus. If you are not adding/editing a box menu then this field should be left blank. On some designs you will be able to add an icon to your menus. This works especially well on your top menu and navigation menu. Click the icon box to scroll through the icons available. They will be applied to your site in your chosen theme colour. If your website and menu (not all menu's on a website are the same) have been designed to work with an colour for the menu then select a colour from the wheel, or paste your hex code including # into the box. If your menu does not support colours then this will have no effect on your site. Ignore this field it no longer serves a purpose. The enabled checkbox is ticked by default and allows the menu to be shown on the site. If the enabled checkbox is not ticked the menu item will not be shown. If you are using a logo or an image with text for your box menu image then you may want to turn the caption off so the title does not cover or repeat the text in the logo. If you want to temporarily remove content from your site while you work on your content then you can uncheck the enabled box to remove it from the menu structure. Once you are ready for it to be added back on your would tick the box and it would reappear. Click save to save any changes made to this menu item.